Watch the sun rise over the ocean over breakfast and watch it set over the mountains with a glass of wine. Walk down to the beach in 5 minutes, go fishing, play golf or tennis or just relax at home. In winter snuggle up in front of the fire while watching SkyTV or enjoy free WIFI on your laptop. Great location. Unbelievable view of Pauanui beach. There aren't many baches which boast views like this. There aren't many baches which boast views like this. 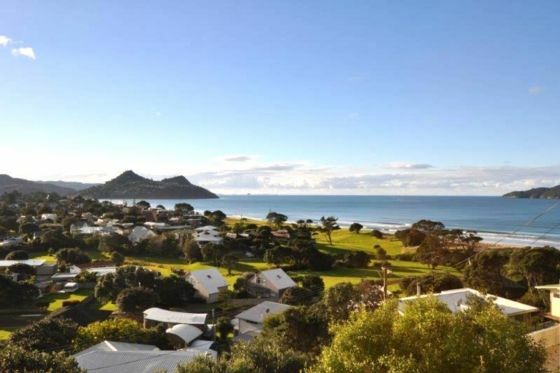 You can spend hours from the deck or dinner table watching the waves all the way to Tairua. It's just a short walk to the southern end of the beach. There's a walking track there too through native bush to either the rocks or up to the top for spectacular views over the area. The house is tidy and comfortable with everything you need - from a boogie board to BBQ. We hope to stay here again. Highly recommended! Wonderful stay and stunning views! Great location, clean, nice place to stay, thank you!